Port Metro Vancouver’s 2008 Economic Impact Study suggested that goods movement on the Lower Fraser River contributed about a billion dollars each year to the provincial GDP at that time. Activity in Surrey alone was valued a $440 million. Over the years, there have been numerous proposals to expand river transportation as an alternative to rail and trucking. Most of the current shipping activity takes place between the Port Mann Bridge and the ocean, but even at the eastern edge of Metro Vancouver we see and hear frequent tugboats hauling logs, sand and gravel, or odd cargoes such as uprooted houses. 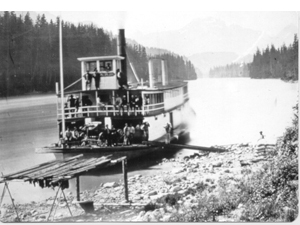 From the early days of settlement up to 1920, river boats were a key mode of transport.between New Westminster and Chilliwack. The Port Haney Wharf below our house was a landing point for passengers, cattle, food supplies and household goods, and the village that grew up around the wharf had a hotel, bank, retails stores and churches. The railway and then the highway made river travel obsolete. There have been passing suggestions around reviving commercial river traffic in upper Fraseropolis — a 2003 Gateway Council study lists Port Kells, Pitt Meadows Airport and Mission as possible container port locations — but this has not emerged as a priority in transportation development. In summer 2011, a group calling itself the Fraser RiverBus Society proposed the creation of a passenger boat service from Port Haney (Maple Ridge) to Richmond. Given the distances, the idea strikes me as delightful but impractical. A New Westminster blogger named Andrew Barton has hashed the issue over and concluded that it makes more sense to upgrade commuter train service. For now, we are happy to watch the tugboats trundle past, and look for the once-per-season visit from the tourist paddlewheeler out of New West. « What Are We Voting For?